I was thinking I needed a small footprint database the other day when coding a small app. If you need something to save small amount of data you can just serialize it to Xml file and back. There is your little database. Obviously not very usable for heavy load, but with a small amount of data it works just fine. There is not much involved lets take a look. If you need to sort using the ListView control it is straight forward. But what about leaving some of the rows out of the sort. For example if you need a total row in the end. Obviously you don’t want that last one as a part of the sort routine. Simply add to the ListViewItem.Tag a string something like DONT_SORT and look for that in the comparer. I did some Json work in C#, I hadn’t done any Json with C# before. Naturally I go googling without much luck at first. When you look for Json libraries and code snippets they are plentiful, but most of them java script browser stuff. Then a friend pointed out Jayrock which was exactly what I needed. It can be used in C# code to address Json feed similar to Xml feeds. As mentioned before json is extremely java script friendly. Let’s take a look at one of the Google examples. Those for loops are a bit ugly to get down the tree to the correct node. There has to be a better way of doing that. With simple data pairs it’s no problem but with heavier feeds like the one I took in the sample it’s not as obvious. If you have a simpler or more elegant way of doing it in C# drop a comment. This is what the Json feed looks like. Here are some tools, that I came up on JsonViewer which is hosted on CodePlex. The viewer also comes with a plugin for Fiddler, which is really handy and also has one for VS. Fiddler is a http debugging proxy. CodePlex is Microsoft’s answer to sourceforge. You can find extensive list of json libraries here, for bunch of different languages. Three friends and I started a company in Iceland back in ’94. We were pretty much fresh out of the University. We did odd projects here and there as young companies go. Then we came up with this brilliant idea, to make a website for the world championship in team handball. 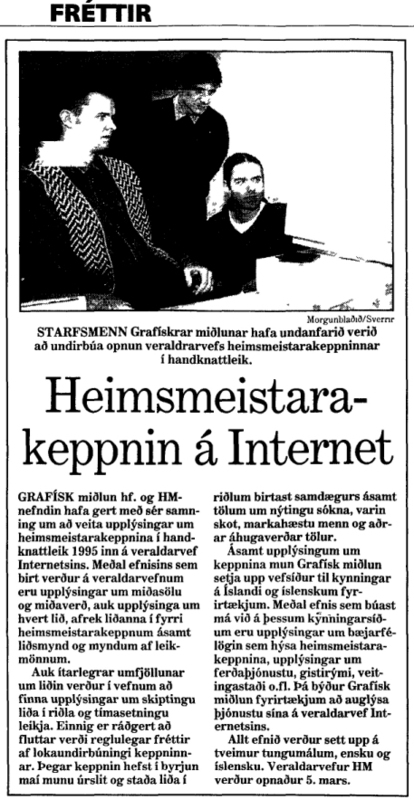 That was to be held in Reykjavik in 1995. There wasn’t much of dynamic web sites at the time, they sure existed not the norm though. After striking a deal with the handball association the work begun. The website even had an Oracle database on the back end for dynamic content. Mostly to look up teams, players and game stats as the tournament took place. Not only that it was also available both in Icelandic and English. Like I said cutting edge in 1995, we even got published in the newspaper and Tv stations. We had just started development when I had to move to New York to secure my green card.